Ever notice how safe playgrounds are these days? I’ve seen them with rubberized poles so that kids don’t hit their heads. I’ve seen them with padding on the ground so that it doesn’t hurt when you fall. Its like letting your kids play in a padded room. Well, not in Moldova. 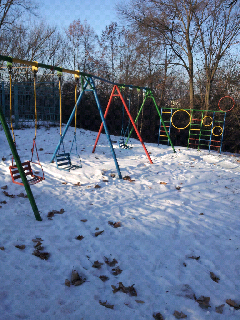 Here, a playground consists of a few random iron bars jutting out of the ground. Have fun kids! Try not to impale youselves!